After a primary tumor is treated, cancer stem cells may still lurk in the body, ready to metastasize and cause a recurrence of the cancer in a form that's more aggressive and resistant to treatment. University of Illinois researchers have developed a molecular probe that seeks out these elusive cells and lights them up so they can be identified, tracked and studied not only in cell cultures, but in their native environment: the body. In a paper published in the journal ACS Central Science, the researchers described the probe's effectiveness in identifying cancer stem cells in cultures of multiple human cancer cell lines as well as in live mice. "It's really the first time to be able to look at cancer stem cells in the complicated environment where they live—not only in cell cultures or artificial tumor environments," said Illinois chemistry professor Jefferson Chan, who led the study. "Seeing them is the first step toward understanding them. Now we can see where they're hiding out, how they change as the disease is progressing or how they respond when you apply treatment." While other commercial agents are available to flag cancer stem cells, their application is limited, Chan said. Some cannot distinguish between live and dead cells, others can mistakenly bind to wrong targets. The most popular—antibodies that seek out markers on the cell's surface—are specific to cell types and their large size can prevent them from reaching the small spaces where cancer stem cells tend to lurk. All are designed for use in cell cultures or artificial tumor environments, which lack the complexity of the whole body, Chan said. In contrast, the new probe, named AlDeSense, is a small molecule that binds to an enzyme related to the property of stemness in cancer cells. The probe becomes activated, emitting a fluorescent signal only when it reacts with the target enzyme—which cancer stem cells produce in high concentrations. In a series of experiments, Chan's group found that the enzyme seems to be a marker of stemness across many types of cancer, indicating that AlDeSense may be broadly applicable for clinical imaging. 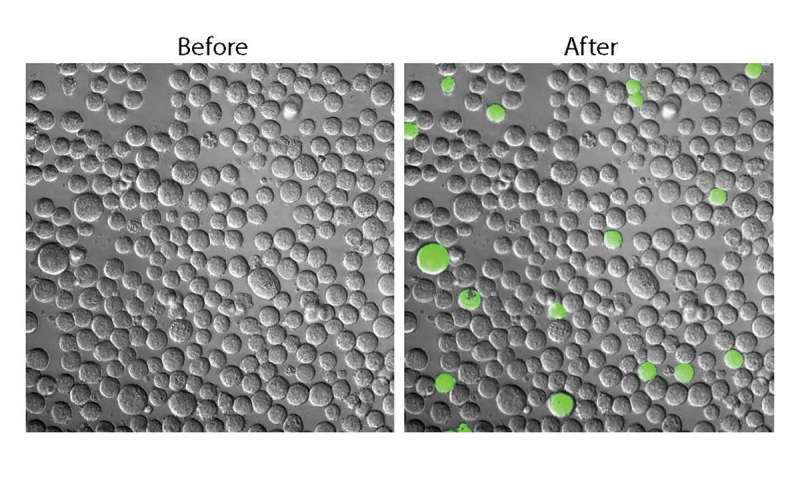 The researchers demonstrated that AlDeSense is compatible with two major cellular techniques—flow cytometry and confocal imaging. Chan's group then partnered with Timothy Fan, a professor of veterinary clinical medicine and veterinary oncology, to find and track cancer stem cells in tissue removed from mice for biopsy and in live mice with metastatic tumors. The ability to find and track cancer stem cells in the body, as well as their state of stemness—the signal decreases as the cells differentiate—allowed the researchers to follow cells from injection to tumor as they spread through the bodies of the mice, answering some fundamental questions of how cancer stem cells behave. "Prior to this study, nobody knew what happens between injection of cancer stem cells and removal of a tumor. There are a lot of models that hypothesize about how cancer stem cells differentiate and grow, but limited experimental data," Chan said. "Through this study, we can see that the stemness properties are maintained in the population, even after they metastasize. There's something about the environment in the body that supports stem cell characteristics. With AlDeSense, now we can profile that environment." Next, the researchers are evaluating whether using AlDeSense to track cancer stem cell populations in tumors can predict prognosis in dogs with lymphoma. They are also working to enable the probe with other functions, such as the capability to selectively kill cancer stem cells. "Another thing we're pursuing is screening for inhibitors or drugs that can kill cancer stem cells by targeting this enzyme," Chan said. "Since we know that our probe only interacts with that one target, we can use the probe to look for a drug that can inhibit this enzyme and verify it in cells and in live animals. The multiscale utility of the molecule makes it unique."